* Items are required. We never spam. Shana Boyd Hackworth, MPAS, PA-C is an NCCPA board-certified physician assistant who has been with our practice since 2004. 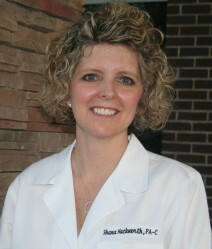 Prior to joining Marietta Dermatology Associates, she practiced dermatology in Knoxville, TN for four years where, after previous years of primary care and ER work, she discovered her love of dermatology and served as a sub-investigator for multiple clinical research trials for the treatment of psoriasis, acne, rosacea, seborrheic dermatitis, genital herpes, and atopic dermatitis. She earned a Bachelor of Science in Physician Assistant Studies from the University of Kentucky and a master’s degree in PA Studies with an emphasis in dermatology from the University of Nebraska. Shana is a member of the American Academy of Physician Assistants, Georgia Academy of Physician Assistants, the Society of Dermatology Physician Assistants, and Georgia Dermatology Physician Assistants, for which she has served as secretary since 2006. When she is not caring for patients at the office, Shana enjoys spending time with her husband Stuart and their three daughters, whom they are raising to be big University of Kentucky fans! They enjoy traveling, visiting their family in Kentucky and are involved with their church. Shana looks forward to getting to know you and your family and caring for your dermatological needs. There's no reason to wait when you have a concern about your skin. Call for an appointment today so we can help you. Whether it's nothing to worry about or something more serious, do yourself a favor and find out for sure.